Established in 1820, the oldest cemetery in the city is the resting place of many of its first residents, including the founder of Hull, Philemon Wright, his wife Abigail Wyman and their descendants. Many regional personalities, notably successful landowner Nicholas Sparks and John Scott, first Mayor of Ottawa, are buried here. 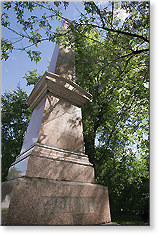 St. James Cemetery contains impressive monuments and gravestones. It owes its name to the former Anglican Parish of St. James, whose fine stone church building, located on promenade du Portage, dates back to 1901. The Church was deconsacrated in 2007.